As a Financial Advisor I also often get questions this time of year about what is deductible. Although I will mention things in broad terms, it is always best to ask your tax advisor about your specific items. Here is a good rule of thumb: If it cannot be used for other purposes and is purchased specifically and exclusively for your Santa business, it is usually deductible. Santa suit - yes, can't be worn to work or church or anything "normal"
Boots - this one is tricky - do you wear them to ride your motorcycle? Do you wear them everyday? With Jeans? Might not be deductible. If they are exclusive to Santa then yes. Eyewear - another tricky one. Do you use them exclusively for Santa? yes if exclusive, no if you wear them everyday. Santa's chair - yes, if it is decorative and not used for other purposes. Hair care products, bleach, etc - complicated. If you bleach year round it may not be deductible. Storage containers - yes, if used only for Santa stuff. Software, computer equipment, cameras, electronics - mostly no, but qualified. You must prove the equipment is dedicated and cannot be used in every day life. Talk to your tax advisor. Most of all, with everything, keep good records! I often recommend that clients buy a 3-ring binder and fill it with paper. Tape receipts to the pages and make notes beside the receipt as to what was purchased and the use. I also recommend that business purchases be made separate from personal purchases. Keep the receipts separate; it is easier that way. Keep your mileage in a small notebook in your car - or even better, if possible do a MapQuest directions printout for your mileage and place in the same 3-ring binder. Santa School, the mileage and travel expenses to get there is deductible. Also, the conventions. I deduct any local community college night classes that are beneficial to my business, i.e., Public Speaking, Acting, Voice Over, Magic, Dale Carnegie and the like. 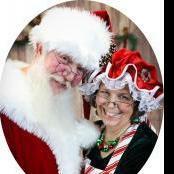 I am self-employed in other adventures of life - attending 1st Santa School this summer. This is very helpful. Thanks! Ģreat thoughts. Thank you, sir.